"FEMA" redirects here. For other uses, see FEMA (disambiguation). The Federal Emergency Management Agency (FEMA) is an agency of the United States Department of Homeland Security, initially created by Presidential Reorganization Plan No. 3 of 1978 and implemented by two Executive Orders on April 1, 1979. The agency's primary purpose is to coordinate the response to a disaster that has occurred in the United States and that overwhelms the resources of local and state authorities. The governor of the state in which the disaster occurs must declare a state of emergency and formally request from the president that FEMA and the federal government respond to the disaster. The only exception to the state's gubernatorial declaration requirement occurs when an emergency or disaster takes place on federal property or to a federal asset—for example, the 1995 bombing of the Alfred P. Murrah Federal Building in Oklahoma City, Oklahoma, or the Space Shuttle Columbia in the 2003 return-flight disaster. While on-the-ground support of disaster recovery efforts is a major part of FEMA's charter, the agency provides state and local governments with experts in specialized fields and funding for rebuilding efforts and relief funds for infrastructure by directing individuals to access low-interest loans, in conjunction with the Small Business Administration. In addition to this, FEMA provides funds for training of response personnel throughout the United States and its territories as part of the agency's preparedness effort. Federal emergency management in the U.S. has existed in one form or another for over 200 years. A series of devastating fires struck the port city of Portsmouth, New Hampshire, early in the 19th century. The 7th U.S. Congress passed a measure in 1803 that provided relief for Portsmouth merchants by extending the time they had for remitting tariffs on imported goods. This is widely considered the first piece of legislation passed by the federal government that provided relief after a disaster. Between 1803 and 1930, ad hoc legislation was passed more than 100 times for relief or compensation after a disaster. Examples include the waiving of duties and tariffs to the merchants of New York City after the Great Fire of New York (1835). After the collapse of the John T. Ford's Theater in June 1893, the 54th Congress passed legislation compensating those who were injured in the building. After the start of the Great Depression in 1929, President Herbert Hoover had commissioned the Reconstruction Finance Corporation in 1932. The purpose of the RFC was to lend money to banks and institutions to stimulate economic activity. RFC was also responsible for dispensing federal dollars in the wake of a disaster. RFC can be considered the first organized federal disaster response agency. The Bureau of Public Roads in 1934 was given authority to finance the reconstruction of highways and roads after a disaster. The Flood Control Act of 1944 also gave the U.S. Army Corps of Engineers authority over flood control and irrigation projects and thus played a major role in disaster recovery from flooding. Federal disaster relief and recovery was brought under the umbrella of the Department of Housing and Urban Development (HUD), in 1973 by Presidential Reorganization Plan No. 2 of 1973, and the Federal Disaster Assistance Administration was created as an organizational unit within the department. This agency would oversee disasters until its incorporation into FEMA in 1978. Prior to implementation of Reorganization Plan No. 3 of 1978 by E.O. 12127 and E.O. 12148, many government agencies were still involved in disaster relief; in some cases, more than 100 separate agencies might be jockeying for control and jurisdiction of a disaster. Over the years, Congress increasingly extended the range of covered categories for assistance, and several presidential executive orders did the same. By enacting these various forms of legislative direction, Congress established a category for annual budgetary amounts of assistance to victims of various types of hazards or disasters, it specified the qualifications, and then it established or delegated the responsibilities to various federal and non-federal agencies. In time, this expanded array of agencies themselves underwent reorganization. One of the first such federal agencies was the Federal Civil Defense Administration, which operated within the Executive Office of the President. Functions to administer disaster relief were then given to the President himself, who delegated to the Housing and Home Finance Administration. Subsequently, a new office of the Office of Defense Mobilization was created. Then, the new Office of Defense and Civilian Mobilization, managed by the EOP; after that, the Office of Civil and Defense Mobilization, which renamed the former agency; then, the Office of Civil Defense, under the Department of Defense (DoD); the Department of Health, Education and Welfare (HEW); the Department of Agriculture; the Office of Emergency Planning (OEmP); the Defense Civil Preparedness Agency (replacing the OCD in the DoD); the Department of Housing and Urban Development (HUD) and the General Services Administration (GSA) (upon termination of the OEmP). These actions demonstrated that, during those years, the nation's domestic preparedness was addressed by several disparate legislative actions, motivated by policy and budgetary earmarking, and not by a single, unifying, comprehensive strategy to meet the nation's needs over time. Then, in 1978 an effort was made to consolidate the several singular functions; FEMA was created to house civil defense and disaster preparedness under one roof. This was a very controversial decision. "National Fire Prevention and Control Administration" redirects here. 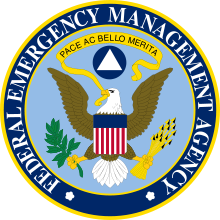 The FEMA seal before 2003. The FEMA flag before 2003. FEMA was established under the 1978 Reorganization Plan No. 3, and activated April 1, 1979, by President Jimmy Carter in an Executive Order. In July, Carter signed Executive Order 12148 shifting disaster relief efforts to the new federal-level agency. FEMA absorbed the Federal Insurance Administration, the National Fire Prevention and Control Administration, the National Weather Service Community Preparedness Program, the Federal Preparedness Agency of the General Services Administration and the Federal Disaster Assistance Administration activities from HUD. FEMA was also given the responsibility for overseeing the nation's Civil Defense, a function which had previously been performed by the Department of Defense's Defense Civil Preparedness Agency. One of the disasters FEMA responded to was the dumping of toxic waste into Love Canal in Niagara Falls, New York, in the late 1970s. FEMA also responded to the Three Mile Island nuclear accident where the nuclear-generating station suffered a partial core meltdown. These disasters, while showing the agency could function properly, also uncovered some inefficiencies. In 1993, President Bill Clinton appointed James Lee Witt as FEMA Director. In 1996, the agency was elevated to cabinet rank. This was not continued by President George W. Bush. Witt initiated reforms that would help to streamline the disaster recovery and mitigation process. The end of the Cold War also allowed the agency's resources to be turned away from civil defense to natural disaster preparedness. In addition, FEMA received authority for counterterrorism through the Nunn-Lugar-Domenici amendment under the Weapons of Mass Destruction Act of 1996, which was a response to the recognized vulnerabilities of the U.S. after the sarin gas attack on the Tokyo subway in 1995. Congress funded FEMA through a combination of regular appropriations and emergency funding in response to events. Following the September 11, 2001, attacks, Congress passed the Homeland Security Act of 2002, which created the Department of Homeland Security (DHS) to better coordinate among the different federal agencies that deal with law enforcement, disaster preparedness and recovery, border protection and civil defense. FEMA was absorbed into DHS effective March 1, 2003. As a result, FEMA became part of the Emergency Preparedness and Response Directorate of Department of Homeland Security, employing more than 2,600 full-time employees. It became the Federal Emergency Management Agency again on March 31, 2007, but remained in DHS. President Bush appointed Michael D. Brown as FEMA's director in January 2003. Brown warned in September 2003 that FEMA's absorption into DHS would make a mockery of FEMA's new motto, "A Nation Prepared", and would "fundamentally sever FEMA from its core functions", "shatter agency morale" and "break longstanding, effective and tested relationships with states and first responder stakeholders". The inevitable result of the reorganization of 2003, warned Brown, would be "an ineffective and uncoordinated response" to a terrorist attack or a natural disaster. Hurricane Katrina in 2005 demonstrated that the vision of further unification of functions and another reorganization could not address the problems FEMA had previously faced. The "Final Report of the Select Bipartisan Committee to Investigate the Preparation for and Response to Hurricane Katrina", released February 15, 2006, by the U.S. Government Printing Office, revealed that federal funding to states for "all hazards" disaster preparedness needs was not awarded unless the local agencies made the purposes for the funding a "just terrorism" function. Emergency management professionals testified that funds for preparedness for natural hazards were given less priority than preparations for counter-terrorism measures. Testimony also expressed the opinion that the mission to mitigate vulnerability and prepare for natural hazard disasters before they occurred had been separated from disaster preparedness functions, making the nation more vulnerable to known hazards, like hurricanes. In fall 2008, FEMA took over coordination of the Ready Campaign, the national public service advertising (PSA) campaign in collaboration with the Ad Council to educate and empower Americans to prepare for and respond to emergencies including natural and man-made disasters. The Ready Campaign and its Spanish language version Listo asks individuals to do three things: build an emergency supply kit, make a family emergency plan and be informed about the different types of emergencies that can occur and how to respond. The campaign messages have been promoted through television, radio, print, outdoor and web PSAs, as well as brochures, toll-free phone lines and the English and Spanish language websites. During the debate of the Homeland Security Act of 2002, some called for FEMA to remain as an independent agency. Later, following the failed response to Hurricane Katrina, critics called for FEMA to be removed from the Department of Homeland Security. Today FEMA exists as a major agency of the Department of Homeland Security. The Administrator for Federal Emergency Management reports directly to the Secretary of Homeland Security. In March 2003, FEMA joined 22 other federal agencies, programs and offices in becoming the Department of Homeland Security. The new department, headed by Secretary Tom Ridge, brought a coordinated approach to national security from emergencies and disasters – both natural and man-made. FEMA manages the National Flood Insurance Program. Other programs FEMA previously administered have since been internalized or shifted under direct DHS control. FEMA is also home to the National Continuity Programs Directorate (formerly the Office of National Security Coordination). ONSC was responsible for developing, exercising, and validating agency-wide continuity of operations and continuity of government plans as well as overseeing and maintaining continuity readiness including the Mount Weather Emergency Operations Center. ONSC also coordinated the continuing efforts of other Federal Executive Agencies. FEMA began administering the Center for Domestic Preparedness in 2007. FEMA has an annual budget of $18 billion that is used and distributed in different states according to the emergencies that occur in each one. An annual list of the use of these funds is disclosed at the end of the year on FEMA's website. FEMA's Mitigation Directorate is responsible for programs that take action before a disaster, in order to identify risks and reduce injuries, loss of property, and recovery time. The agency has major analysis programs for floods, hurricanes and tropical storms, dams, and earthquakes. The safe room construction plans and specifications from FEMA P-320, Taking Shelter From the Storm, are available in pdf format. FEMA's emergency response is based on small, decentralized teams trained in such areas as the National Disaster Medical System (NDMS), Urban Search and Rescue (USAR), Disaster Mortuary Operations Response Team (DMORT), Disaster Medical Assistance Team (DMAT), and Mobile Emergency Response Support (MERS). FEMA's National Response Coordination Center (NRCC) is a multiagency center located at FEMA HQ that coordinates the overall Federal support for major disasters and emergencies, including catastrophic incidents in support of operations at the regional level. The FEMA Administrator, or his or her delegate, activates the NRCC in anticipation of, or in response to, an incident by activating the NRCC staff, which includes FEMA personnel, the appropriate Emergency Support Functions, and other appropriate personnel (including nongovernmental organization and private sector representatives). During the initial stages of a response, FEMA will, as part of the whole community, focus on projected, potential, or escalating critical incident activities. The NRCC coordinates with the affected region(s) and provides needed resources and policy guidance in support of incident-level operations. The NRCC staff specifically provides emergency management coordination, planning, resource deployment, and collects and disseminates incident information as it builds and maintains situational awareness—all at the national-level. FEMA maintains the NRCC as a functional component of the NOC for incident support operations. An example of NRCC activity is the coordination of emergency management activities that took place in connection with the 2013 Colorado floods. The National Disaster Medical System (NDMS) was transferred from the Department of Homeland Security to the Department of Health and Human Services, under the Pandemic and All-Hazards Preparedness Act, signed by President George W. Bush, on December 18, 2006. NDMS is made of teams that provide medical and allied care to disaster victims. These teams include doctors, nurses, pharmacists, etc., and are typically sponsored by hospitals, public safety agencies or private organizations. Also, Rapid Deployment Force (RDF) teams, composed of officers of the Commissioned Corps of the United States Public Health Service, were developed to assist with the NDMS. Disaster Medical Assistance Teams (DMAT) provide medical care at disasters and are typically made up of doctors and paramedics. There are also National Nursing Response Teams (NNRT), National Pharmacy Response Teams (NPRT) and Veterinary Medical Assistance Teams (VMAT). Disaster Mortuary Operational Response Teams (DMORT) provide mortuary and forensic services. National Medical Response Teams (NMRT) are equipped to decontaminate victims of chemical and biological agents. The Urban Search and Rescue Task Forces perform rescue of victims from structural collapses, confined spaces, and other disasters, for example, mine collapses and earthquakes. Presidential mobile phone alert for national emergencies. FEMA vehicle provides communications support after a major hurricane. These teams provide communications support to local public safety. For instance, they may operate a truck with satellite uplink, computers, telephone, and power generation at a staging area near a disaster so that the responders can communicate with the outside world. There are also Mobile Air Transportable Telecommunications System (MATTS) assets which can be airlifted in. Also, portable cell phone towers can be erected to allow local responders to access telephone systems. The first test of the national wireless emergency system by FEMA was broadcast to an estimated 225 million electronic devices at 14:18 EDT on 3 October 2018. The text message was accompanied by a flashing warning sign and warning tone. The president may direct FEMA to broadcast such alerts only for national emergencies or if the public is in danger. The facility may not be used for personal messages from the president. Mobile phone owners can not opt out of these warnings. On August 1, 2008, FEMA released "Planning Guidance for Protection and Recovery Following Radiological Dispersal Device (RDD) and Improvised Nuclear Device (IND) incidents", which provide an action guide in the case of radioactive contamination. This guidance is specified as action guide for Radiological Dispersal Devices (RDD) and Improvised Nuclear Devices (IND) involving high levels of radiation. According to the Federation of American Scientists, during the Cold War FEMA prepared assessments of the likely consequences of a full-scale Soviet nuclear attack on the United States for use in planning mitigation and recovery efforts. FEMA also prepared plans for evacuating major U.S. cities in response to a nuclear war, dubbed CRP-2B. FEMA offers a large number of training classes, either at its own centers, through programs at the state level, in cooperation with colleges and universities, or online. The latter are free classes available to anyone, although only those with U.S. residency or work eligibility can take the final examinations. More information is available on the FEMA website under the "Emergency Personnel" and "Training" subheadings. Other emergency response information for citizens is also available at its website. FEMA runs the Incident Workforce Academy, a two-week emergency preparedness training program for FEMA employees. The first class of the academy graduated in early 2014. The Training and Education Division within FEMA's National Integration Center directly funds training for responders and provides guidance on training-related expenditures under FEMA's grant programs. Information on designing effective training for first responders is available from the Training and Education Division. Emergency managers and other interested members of the public can take independent study courses for certification at FEMA's online Emergency Management Institute. EMI maintains a strategic partnerships with Frederick Community College. FCC has contracted with the Emergency Management Institute to provide college credit for the Independent Study Program (ISP). FCC offers eight specialized Letters of Recognition, an Undergraduate Certificate, and an Associate of Applied Science degree in Emergency Management. FEMA Corps, who range in age from 18 to 24 years old, is a cadre dedicated to disaster response and recovery. It is a new partnership between The Corporation for National and Community Service's AmeriCorps NCCC and FEMA. The Corps described as a "dedicated, trained, and reliable disaster workforce" works full-time for 10 months on federal disaster response and recovery efforts. Over 150 members of the inaugural FEMA Corps class graduated in June 2013, at the AmeriCorps NCCC campus in Vicksburg, Mississippi. The Corps work on teams of 8 to 12 people and follow the traditional NCCC model of living together and traveling together. In addition to working with FEMA, corps members must perform AmeriCorps responsibilities such as Physical Training three times a week, National Days of Service, and Individual Service Projects in communities throughout the United States. The Corps receives $4.75 a day for food and a living stipend of approximately $4,000 over 10 months. An education award is distributed to corps members who successfully serve 10 months of service, completing 1,700 total hours. FEMA has led a Public-Private Partnership in creating a National Donations Management Program making it easier for corporations or individuals not previously engaged to make offers of free assistance to States and the Federal Government in times of disaster. The program is a partnership among FEMA, relief agencies, corporations/corporate associations and participating state governments. The technical backbone of the program is an online technology solution called The Aidmatrix Network which is managed by the independent nonprofit organization, Aidmatrix. In August 1992, Hurricane Andrew struck the Florida and Louisiana coasts with 165 mph (265 km/h) sustained winds. FEMA was widely criticized for its response to Andrew, summed up by the famous exclamation, "Where in the hell is the cavalry on this one?" by Kate Hale, emergency management director for Dade County, Florida. FEMA and the federal government at large were accused of not responding fast enough to house, feed and sustain the approximately 250,000 people left homeless in the affected areas. Within five days the federal government and neighboring states had dispatched 20,000 National Guard and active duty troops to South Dade County to set up temporary housing. This event and FEMA's performance was reviewed by the National Academy of Public Administration in its February 1993 report "Coping With Catastrophe" which identified several basic paradigms in Emergency Management and FEMA administration that were causes of the failed response. FEMA had previously been criticized for its response to Hurricane Hugo, which hit South Carolina in September 1989, and many of the same issues that plagued the agency during Hurricane Andrew were also evident during the response to Hurricane Katrina in 2005. Additionally, upon incorporation into DHS, FEMA was legally dissolved and a new Emergency Preparedness and Response Directorate was established in DHS to replace it. Following enactment of the Post Katrina Emergency Management Reform Act of 2006 FEMA was reestablished as an entity within DHS, on March 31, 2007. When Hurricane Frances hit South Florida on Labor Day weekend (over 100 miles north of Miami-Dade County), 9,800 Miami-Dade applicants were approved by FEMA for $21 million in storm claims for new furniture; clothes; thousands of new televisions, microwaves and refrigerators; cars; dental bills; and a funeral even though the Medical Examiner recorded no deaths from Frances. A U.S. Senate committee and the inspector general of the Department of Homeland Security found that FEMA inappropriately declared Miami-Dade county a disaster area and then awarded millions, often without verifying storm damage or a need for assistance. FEMA used hurricane aid money to pay funeral expenses for at least 203 Floridians whose deaths were not caused by the 2004 hurricanes, the state's coroners have concluded. Ten of the people whose funerals were paid for were not in Florida at the time of their deaths. FEMA received intense criticism for its response to the Hurricane Katrina disaster in August 2005. FEMA had pre-positioned response personnel in the Gulf Coast region. However, many could not render direct assistance and were only able to report on the dire situation along the Gulf Coast, especially from New Orleans. Within three days, a large contingent of National Guard and active duty troops were deployed to the region. The enormous number of evacuees simply overwhelmed rescue personnel. The situation was compounded by flood waters in the city that hampered transportation and poor communication among the federal government, state, and local entities. FEMA was widely criticized for what is seen as a slow initial response to the disaster and an inability to effectively manage, care for, and move those who were trying to leave the city. Then-FEMA Director Michael D. Brown was criticized personally for a slow response and an apparent disconnection with the situation. Michael Brown would eventually be relieved of command of the Katrina disaster and soon thereafter resigned. "The Secretary Department of Homeland Security should have designated the Principal Federal Official on Saturday, two days prior to landfall, from the roster of PFOs who had successfully completed the required training, unlike then FEMA Director Michael Brown. Considerable confusion was caused by the Secretary's PFO decisions." "DHS and FEMA lacked adequate trained and experienced staff for the Katrina response." "The readiness of FEMA's national emergency response teams was inadequate and reduced the effectiveness of the federal response." "Long-standing weaknesses and the magnitude of the disaster overwhelmed FEMA's ability to provide emergency shelter and temporary housing." "FEMA logistics and contracting systems did not support a targeted, massive, and sustained provision of commodities." "Before Katrina, FEMA suffered from a lack of sufficiently trained procurement professionals." A DMAT member assures a rescued man that the trip to the airport will be safe. For years emergency management professionals have been warning that FEMA's preparedness has eroded. Many believe this erosion is a result of the separation of the preparedness function from FEMA, the drain of long-term professional staff along with their institutional knowledge and expertise, and the inadequate readiness of FEMA's national emergency response teams. The combination of these staffing, training, and organizational structures made FEMA's inadequate performance in the face of a disaster the size of Katrina all but inevitable. Pursuant to a temporary restraining order issued by Hon. Stanwood R. Duval, United States District Court Judge, Eastern District of Louisiana as a result of the McWaters v. FEMA class-action, February 7, 2006 was set as the deadline for the official end of any further coverage of temporary housing costs for Katrina victims. After the February 7 deadline, Katrina victims were left to their own devices either to find permanent housing for the long term or to continue in social welfare programs set up by other organizations. There were many Katrina evacuees living in temporary shelters or trailer parks set up by FEMA and other relief organizations in the first months after the disaster hit, but much more were still unable to find housing. In July 2007, ice that had been ordered for Katrina victims but had never been used and kept in storage facilities, at a cost of $12.5 million, was melted down. In June 2008, a CNN investigation found that FEMA gave away about $85 million in household goods meant for Hurricane Katrina victims to 16 other states. FEMA came under attack for their response to the October Surprise Storm on October 13, 2006, in Buffalo, New York. As FEMA legally cannot interfere with state business unless asked, FEMA responded that as per procedure, the Governor of the state of New York had not asked for FEMA's assistance. FEMA Headquarters had been in constant contact with State congressional offices providing them with the latest information available. Claims state that FEMA officials did not arrive until October 16, three days after the storm hit. The snowstorm damage by this time included downed power wires, downed trees, and structural damage to homes and businesses. Many people of Dumas, Arkansas, especially victims of February 24, 2007 tornadoes, criticized FEMA's response in not supplying the number of new trailers they needed, and only sending a set of used trailers, lower than the needed quantity. Following the storm, U.S Senator Mark Pryor had criticized FEMA's response to the recovery and cleanup efforts. FEMA came under intense criticism when it was revealed that a press conference on the October 2007 California wildfires was staged. Deputy Administrator Harvey E. Johnson was answering questions from FEMA employees who were posing as reporters. Many of these questions were "softball" questions (i.e., "Are you happy with FEMA's response so far? "), intentionally asked in a way that would evoke a positive response giving the impression that FEMA was doing everything right. In this way, any scrutiny from real reporters (many of whom were only given a 15-minute notice) would have been avoided. Fox News, MSNBC, and other media outlets aired the staged press briefing live. Real reporters were notified only 15 minutes in advance and were only able to call into a conference line, which was set to "listen-only" mode. The only people there were primarily FEMA public affairs employees. In September 2017, Hurricane Maria struck Dominica and Puerto Rico with 175 mph (280 km/h) sustained winds. Maria was the fifth-strongest storm to ever strike the United States with stronger winds than those brought by Irma and similar rain brought to Houston by Hurricane Harvey. Despite FEMA's preemptive efforts in Puerto Rico, the island was still devastated beyond expectation. The agency had prepared some provisions for displaced residents before the storm struck, including: roughly 124 FEMA staff members being positioned on the island, food, water, and bedding. However, people reported the FEMA food packages were unhealthy snacks such as the confectionery Skittles. FEMA was widely criticized for its response to Maria, as the island quickly fell into a humanitarian crisis. The island also experienced a massive loss of power as a result of flood and wind damage sustained during Maria. In the beginning of October 2017, Lieutenant General Todd Semonite, chief and commanding general of the United States Army Corps of Engineers, explained the extent of and necessity of aid for this power crisis. Semonite described some specifics of the outage to reporters, explaining that the island requires "2,700 megawatts of electricity to operate and at last count had 376 megawatts available." This translates to about 14 percent of the grid being functional. FEMA Administrator William "Brock" Long told reporters in a briefing following the storm that Puerto Rico politics had hindered the ability of the federal government to send aid. He explained that political divisions had prevented unity for leaders in this time of crisis, describing that their issue was "even worse" than the mainland United States' issue between Democrats and Republicans. Residents, in some cases, were required to fill out paperwork in English rather than Spanish with little to no hope of receiving the aid they had requested. Brigadier General Jose Reyes of the Puerto Rico National Guard discussed a strategy to quicken the arrival of resources via the Port of Ponce, located on the southern coast of Puerto Rico. Reyes also attributed the delay in these services to the unprecedented series of storms that demanded attention from the agency within a short period of time. Regarding this, General Reyes told reporters " We were not even getting back on our feet after Irma, then suddenly we got hit by Maria." He also addressed the disparities between aid sent to mainland disaster stricken areas and Puerto Rico, explaining that in areas such as Florida and Texas, who had recently struck with similar damages, transportation of resources is relatively simpler. This is because they are able to utilize infrastructure to transport aid. Transporting similar resources to Puerto Rico has proved to be more difficult, as they must travel across the ocean, either in aircraft or in ships. Long also mentioned that Puerto Rico's international airport was not able to operate at full capacity, which posed an additional obstacle for federal aid imports. Hurricane Harvey made landfall in late August 2017, as a Category 4 Hurricane. The Hurricane predominantly affected southeast Texas; however, its effects were felt as far as Arkansas, Kentucky, and Tennessee in the form of flash flooding. Harvey slowly progressed around southeast Texas, where it produced heavy precipitation over the region. This caused heavy flooding in residential areas such as Colorado City, Liberty, and Montgomery, Texas. Harvey was the first of a series of hurricanes and tropical storms to affect the United States between August and September 2017. The effects of these storms included extreme flooding, damage from high speed winds, structural damage, and humanitarian concerns regarding the availability of basic necessities such as food, water, and shelter. Some recipients were forced to wait up to two months before receiving aid from FEMA, as technical complications held up both their application for it and the processing of said applications. Some residents were denied Federal Aid and have to dispute their denial in efforts to rebuild and repair properties without taking a considerably large financial loss. The costs of a disaster to states and localities can pile up quickly. Federal assistance becomes fully available with the approval of the President and at the request of the governor. Public help for governments to repair facilities is 75% federally funded with local governments responsible for covering the rest (unless the state grants aid or loans). FEMA does not compensate for buildings that have been improperly maintained by the state or local government nor does it pay to upgrade or improve facilities. FEMA coordinates but does not fund disaster assistance provided by the Small Business Administration or the Farmers Home Administration. FEMA grant-in aid funds come from revenue sharing, the Department of Housing and Urban Development and the Department of Transportation. Grants for disaster preparedness can be used by flood control districts. Many states have disaster relief agencies of their own. In the event of a disaster outside of a state's operating capacity, the director of said agency will advise the Governor whether or not to proclaim a state of emergency. Declaring a state of emergency, upon Presidential approval, entitles a state to federal assistance. It is important to note that proclaiming a state of emergency does not guarantee federal assistance. States also rely on mutual aid agreements, such as the Civil Defense and Disaster Compact. A mutual aid agreement can be between neighboring states, cities, counties and cities, states and cities or an entire region. These agreements allow agencies to share resources so they are better prepared for emergencies. Having a mostly intact tax base allows local governments to maintain steady revenue stream. Business unharmed by a disaster will be able to continue to generate sales tax revenue. Cities with access to large revenue reserves and strong mutual aid agreements will have greater response capacity. While cities with large municipal debt that would be unable to pay back state or federal loans would be in a difficult situation. This case gave FEMA the right to sue in order to recover funds paid out in flood insurance claims for flood damage as a result of poor decisions by local officials and developers. The case also gave FEMA the power to sue localities who fail to meet flood plain management requirements. ^ a b "Executive Order 12127—Federal Emergency Management Agency". Federation of American Scientists. ^ a b "Department of Homeland Security Federal Emergency Management Agency, Fiscal Year 2018". ^ "Increased FEMA budget part of President's 2016 proposal". February 5, 2015. Archived from the original on August 14, 2018. Retrieved September 10, 2016. ^ "11 years after Katrina, FEMA has learned from its failures". ^ Woolley, Lynn (September 12, 2005). "FEMA – Disaster of an Agency". Archived from the original on June 28, 2009. Retrieved December 12, 2007. See Federation of American Scientists reference above for effective date of April 1, 1979, stated in Executive Order 12127. ^ "The Federal Emergency Management Agency" (PDF). Fema.gov. November 2010. Retrieved February 3, 2017. ^ History of Federal Domestic Disaster Aid Before the Civil War Archived December 14, 2011, at the Wayback Machine, Biot Report #379: July 24, 2006. Suburban Emergency Management Project. ^ "Guide to House Records: Chapter 23 Ford's Theater Disaster". Archives.gov. Retrieved September 8, 2016. ^ a b "Records of the Federal Emergency Management Agency [FEMA]". National Archives. U.S. Government. ^ a b "FEMA History" Archived May 9, 2008, at the Wayback Machine. Federal Emergency Management Agency. ^ a b c Bea, Keith, "Proposed Transfer of FEMA to the Department of Homeland Security", Order Code RL31510 (updated July 29, 2002), Report for Congress, Congressional Research Service: Library of Congress. ^ a b Falkenrath, Richard S., "Problems of Preparedness: U.S. Readiness for a Domestic Terrorist Attack" (2001)International Security, Boston. ^ a b "President Clinton Raises FEMA Director to Cabinet Status" (Press release). Federal Emergency Management Agency. February 26, 1996. Archived from the original on January 16, 1997. Retrieved March 3, 2010. ^ Murry, Justin (updated July 10, 2006). "Emergency Supplemental Appropriations Legislation for Disaster Assistance: Summary Data FY1989 to FY2006", CRS Report for Congress, Congressional Research Service: The Library of Congress. ^ Grunwald, Michael; Glasser, Susan (December 23, 2005). "Brown's Turf Wars Sapped FEMA's Strength". The Washington Post. p. A01. Retrieved April 18, 2007. ^ Senate Bipartisan Committee (February 15, 2006), "The Final Report of the Select Bipartisan Committee to Investigate the Preparation for and Response to Hurricane Katrina, U.S. Government Printing Office: Washington, D.C.
^ Senate Bipartisan Committee, 2006, p. 208. ^ "Build A Kit | Ready.gov". Ready.gov. Retrieved October 31, 2016. ^ "Make A Plan | Ready.gov". Ready.gov. Retrieved October 31, 2016. ^ "About the Ready Campaign | Ready.gov". Ready.gov. Retrieved October 31, 2016. ^ "Emergency Preparedness". AdCouncil. Retrieved October 31, 2016. 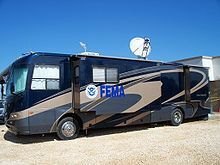 ^ Serving America's Disaster Victims: FEMA Where Does it Fit? Homeland Security Policy Institute. January 13, 2009. ^ "Hurricane Sandy Anniversary 2014: Billions Of Dollars In Federal Aid Still Unpaid". October 29, 2014. ^ "FY2015 FEMA Budget". C-span.org. ^ "FEMA Wasted Billions on Administrative Costs". Thefiscaltimes.com. ^ "Why New Jersey Got Billions Less Than New York in FEMA Disaster Aid After Sandy – NJ Spotlight". Njspotlight.com. ^ a b "FEMA's Mitigation Directorate Fact Sheet". Federal Emergency Management Agency. ^ HAZUS Archived July 4, 2012, at the Wayback Machine is a computer model for hurricane, earthquake, and flood damage estimates. ^ "FEMA Taking Shelter From the Storm". Fema.gov. Retrieved March 6, 2019. ^ "National Response Framework : Second Edition" (PDF). Fema.gov. May 2013. Retrieved October 3, 2018. ^ "FEMA's State-of-the-Art National Response Coordination Center". 2002-2009-fpc.state.gov. Archived from the original on March 8, 2016. Retrieved April 18, 2016. ^ National Response Framework. May 2013. p. 43. ^ "National Response Coordination Center: It Takes A Whole Community for Response". Fema.gov. Retrieved December 16, 2017. ^ "Homeland Security Today: FEMA Monitors Colorado Flooding; Supports State, Local Response". HSToday.us. Archived from the original on September 21, 2013. Retrieved December 16, 2017. ^ Here’s what Vail learned when it tried out the “Presidential Alert” messaging system FEMA will test Wednesday Denver Post, 2018-10-01. ^ “Presidential alert” sounds off on mobile phones nationwide Denver Post, 2018-10-03. ^ FEMA, DHS "Planning Guidance for Protection and Recovery Following RDD and IND incidents" Archived May 18, 2011, at the Wayback Machine. Retrieved July 6, 2011. ^ "Nuclear Attack Planning Base – 1990. ^ Limardo, Jessica. "First FEMA Incident Workforce Academy class graduates" Archived February 13, 2014, at Archive.today. BioPrepWatch. February 13, 2014. (Retrieved February 13, 2014). ^ "Emergency Management Institute (EMI) – EMI Programs and Activities". Training.fema.gov. Retrieved April 18, 2016. ^ "Emergency Management". Frederick.edu. April 4, 2014. Archived from the original on February 20, 2014. Retrieved April 20, 2014. ^ Announcing the Creation of FEMA Corps. FEMA.gov (June 16, 2012). Retrieved August 16, 2013. ^ Welcome to the FEMA Corps Inaugural Class |Homeland Security. Dhs.gov (September 14, 2012). Retrieved August 16, 2013. ^ "Sun-Sentinel Investigation: FEMA". Sun-Sentinel. Retrieved April 18, 2007. ^ Kestin, Sally; O'Matz, Megan (October 10, 2004). "FEMA Gave $21 Million in Miami-Dade, Where Storms Were 'Like a Severe Thunderstorm'". Sun-Sentinel. Retrieved April 18, 2007. ^ Kestin, Sally (June 8, 2005). "Homestead Women Sentenced to Probation for Cheating FEMA". Sun-Sentinel. Retrieved April 18, 2007. ^ Kestin, Sally (August 10, 2005). "FEMA Paid for at Least 203 Funerals Not Related to 2004 Hurricanes". Sun-Sentinel. Retrieved April 18, 2007. ^ "Executive Summary, Select Bipartisan Committee to Investigate the Preparation for and Response to Hurricane Katrina" Archived February 11, 2012, at the Wayback Machine. February 15, 2006. U.S. Government Printing Office. Retrieved June 11, 2007. ^ a b "FEMA, Select Bipartisan Committee to Investigate the Preparation for and Response to Hurricane Katrina" Archived March 2, 2012, at the Wayback Machine. February 15, 2006. U.S. Government Printing Office. Retrieved June 11, 2007. ^ "FEMA To Melt Ice Stored Since Katrina". CBS News. ^ FEMA Gives Away $85 Million of Supplies for Katrina Victims". CNN. ^ "Ark. Pols Blast FEMA for Tornado Response". USA Today. ^ "FEMA Stages Press Conference: Staff Pose As Journalists And Ask 'Softball' Questions". ThinkProgress.org. Retrieved April 18, 2016. ^ Ripley, Amanda (October 28, 2007). "Why FEMA Fakes It with the Press". Time. ^ "Are Hurricane Maria Survivors Getting 'Skittle Meals' From The Government?". Snopes.com. October 16, 2017. Retrieved October 17, 2017. ^ Walsh, Deirdre (September 26, 2017). "Ryan says Puerto Rico will get aid, calls situation 'a humanitarian crisis'". Cnn.com. Retrieved October 17, 2017. ^ Campbell, Alexia Fernandez (October 16, 2017). "FEMA has yet to authorize full disaster help for Puerto Rico". Vox.com. Retrieved October 17, 2017. ^ a b c Achenbach, Joel; Hernández, Arelis R. (October 9, 2017). "FEMA administrator: Puerto Rico's politics, lack of unity, hindering hurricane response". Retrieved December 16, 2017 – via www.WashingtonPost.com. ^ "Port of PONCE (PR PSE) details - Departures, Expected Arrivals and Port Calls - AIS Marine Traffic". MarineTraffic.com. Retrieved December 16, 2017. ^ a b "Historic Hurricane Harvey's Recap". Weather.com. September 2, 2017. Retrieved December 2, 2017. ^ "Texas Hurricane Harvey (DR-4332) - FEMA.gov". Fema.gov. Retrieved December 16, 2017. ^ AJ Willingham. "A look at four storms from one brutal hurricane season". Cnn.com. Retrieved December 16, 2017. ^ "Hurricane Season 2017 - OCHA". UNOCHA.org. Retrieved December 16, 2017. ^ a b Settle, Allen K. "Financing Disaster Mitigation, Preparedness, Response, and Recovery." Public Administration Review, vol. 45, 1985, pp. 101–106. JSTOR, JSTOR, www.jstor.org/stable/3135004. Wikimedia Commons has media related to Federal Emergency Management Agency.